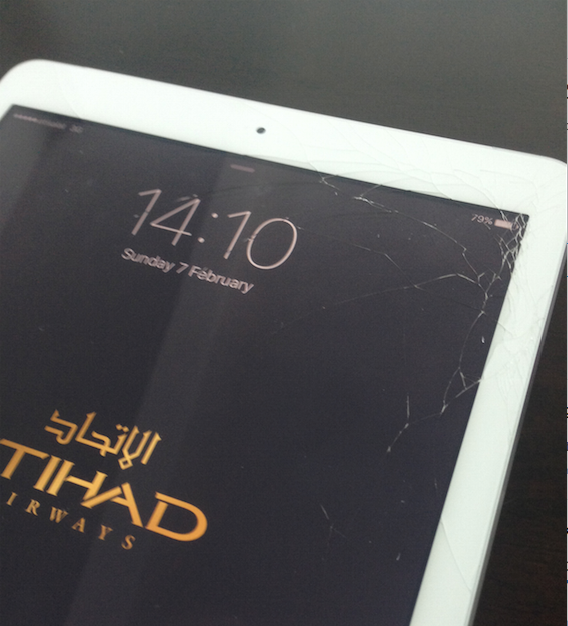 It’s never any fun dropping your Apple device and ending up with a broken iPad Air screen in Abu Dhabi. Such was the case with Katie today. We got a call from her earlier this morning. She is a crew member at one of the UAE’s finest airlines and had stepped away briefly to tend to some business. When she went to unlock her iPad Air screen, she must have caught the edge with her jacket. Sadly, she watched it fall to the ground – shattering the screen and leaving it to what you can see in the picture. She was devastated and thought it was going to be an incredible hassle and incredibly expensive to get her broken iPad Air screen replaced. She began asking around with her fellow crew members. 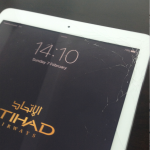 Did anyone know where to get a broken iPad Air screen fixed in either Dubai or Abu Dhabi. Is there a service out there that replaces cracked iPad Air screens? She loves this device. She has movies on it, pictures, music, writes emails, and Skypes with her family and friends back home. Katie began asking herself it she would still be able to use her broken iPad Air screen. After a few hours of asking around, she decided to turn to the web and search for repair shops in the UAE that repair cracked iPad screens. Within minutes she found a repair service that not only repairs broken iPad Air screens, but also provides the convenience of coming to their clients and replacing the cracked screen right in front of them. As we mentioned above, Katie gave us a call and we set up an appointment with her for later in the afternoon at her apartment in Abu Dhabi. In just under an hour we replaced her cracked and got it looking like new again. Safe travels, Katie!